Injuries: Hip and pelvic injuries, including multiple displaced fractures. 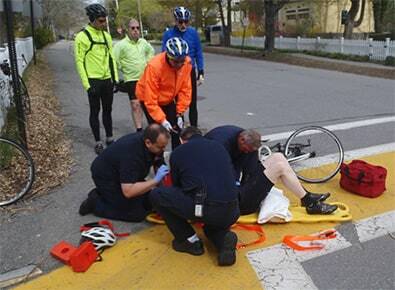 Details of the Case: In May 2014, our client, a 59-year-old cyclist, met members of his cycling club at an elementary school in Concord, Massachusetts. The group was planning to take a 28-mile bike ride. As our client followed the other cyclists out of the parking lot and onto the long driveway leading to the street, there was a four-way stop sign. Our client came to a full stop at his stop sign at the end of the driveway and then proceeded into the intersection to make a left turn onto the nearby street. A driver rolled straight through his stop sign while our client was in the intersection, striking and slamming him to the ground. Our client suffered serious injuries. The driver was cited by Concord Police for failing to come to a complete stop at the stop sign and for proceeding into the intersection before it was safe to do so. In spite of this citation and eye witness testimony that he did not stop at the stop sign, the driver testified that he did stop and that the cyclist rode into his vehicle. His testimony was proven to be not believable through depositions taken by Mr. Gluck of the witness and police. Our client was physically fit at the time of the accident. He taught at a private school for more than a decade and lived on a farm where he woke up early to feed horses and tend to the farm every day. After the accident, our client was transported to a local hospital and was then transferred to Massachusetts General Hospital. He was hospitalized for five days during which time he underwent major surgery with placement of a great deal of metal to piece back together his shattered pelvis and hip area. He was transferred to Spaulding Rehabilitation Hospital for an additional 13 days and was unable to engage in most of his usual activities for the next six months, including tending to his farm. Family members had to change their schedules to handle these responsibilities. After undergoing a lengthy period of rehabilitation he was able to return to most of his usual activities. The case was litigated for 18 months. Six months before the scheduled trial date a mediation took place at which the insurance company for the driver made an inadequate offer of settlement which our client rejected. Over the next several months the final steps were taken to ready the case for trial. Two weeks before the scheduled trial date, the same insurance company more than doubled its offer and the case settled. Read more about Attorney Ronald E. Gluck. Attorney Gluck represents clients injured in serious personal injury cases, including pedestrian, bicycle, motorcycle and automobile accidents. He has practiced law in Boston for over 35 years and has been consistently recognized as a top rated personal injury attorney on the Super Lawyers list, which is published annually in Boston Magazine.